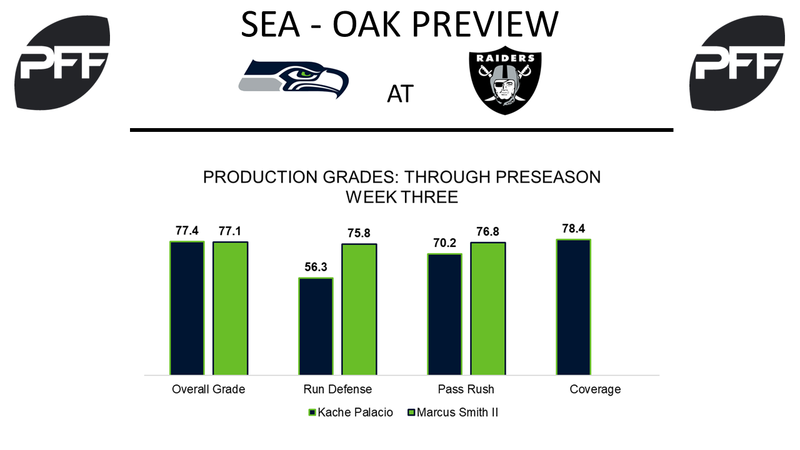 Smith and Palacio are currently battling for a linebacking position and are both in the top-three for overall grade among fellow Seahawks, behind only Russell Wilson. Palacio’s 77.4 overall grade through three games slightly edges out Smith’s 77.1 while also having played 16 more snaps this preseason. Though Smith has seen 35 more pass-rushing snaps, he has only two more quarterback pressures (four) than Palacio, who has two on only seven pass-rushing snaps for a pass-rush productivity of 21.4. Palacio has shown more versatility in the preseason with his five combined defensive stops (three run game, two pass game) on 65 snaps while Smith has two in the run game on 49 snaps. Dewey McDonald, LB- Reserve linebacker Dewey McDonald had an up and down game, as he was extremely efficient against the run, making three run stops on six snaps, but earned a 39.0 coverage game grade while adding a missed tackle in the passing game. It has been the theme for McDonald this preseason as his 83.3 run defense grade leads all Seahawks players while his 46.0 coverage grade ranks 22nd on the team. Pierre Desir, CB- Desir’s overall grade through preseason ranks 27th among cornerbacks and his coverage grade of 78.4 ranks second among all Seahawks’ defensive backs, behind only Richard Sherman. Only four other cornerbacks with 10 or more targets have allowed a lower passer rating into their coverage than Desir, who currently has allowed only three catches on ten targets for 26 yards and a passer rating of 39.6. Matt Tobin, LT- In his first game with the Seahawks since being acquired in a trade, Tobin faced 13 pass-blocking snaps and was perfect by not surrendering a quarterback pressure. It was said that he would compete for the starting left tackle position. Combined with his time in Philadelphia this preseason, Tobin has allowed only two quarterback pressures on 53 pass blocking snaps and will get a look in the final preseason game. 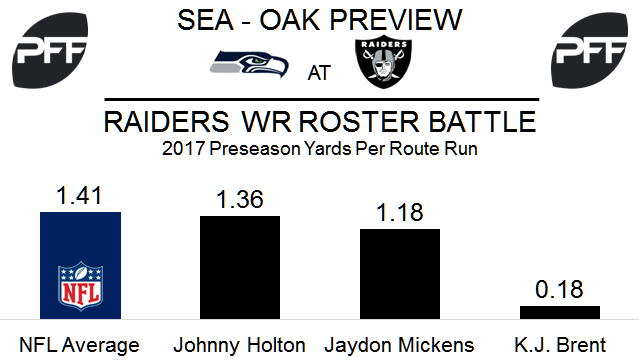 The Raiders kept five wide receivers on their roster last season but could go with six in 2017, so these three undrafted free agents from 2016 are fighting for one or maybe two roster spots. Holton was the team’s fifth receiver in 2016 and only saw 60 snaps on offense, but played 149 snaps on special teams. He leads all Oakland wide receivers this preseason with 75 snaps and 13 targets, but caught only four of those and dropped two. Mickens has run all 44 of his routes this preseason from the slot. He has been targeted eight times with six receptions and 1.18 yards per route run from the slot, which is 32nd of 63 receivers with 20-plus slot routes run. Brent has not been involved in the offense much this preseason with only one catch on four targets, but he has played 19 snaps on special teams. Nicholas Morrow, LB – The undersized linebacker who was an undrafted free agent from Division III Greenville is making a push for a roster spot. Morrow has played well in coverage, only allowing two catches for 12 yards in 37 cover snaps, and a 0.32 yards per cover snap that’s 16th of 57 linebackers with 30-plus snaps in coverage this preseason. Shalom Luani, S – The seventh-round pick is the 23rd-highest graded safety this preseason among 141 safeties that have played 50-plus snaps with an 80.4 overall PFF grade. Luani has only missed one tackle in 13 attempts this preseason. Jylan Ware, OT – Ware has struggled this preseason and is battling for a roster spot in this game. 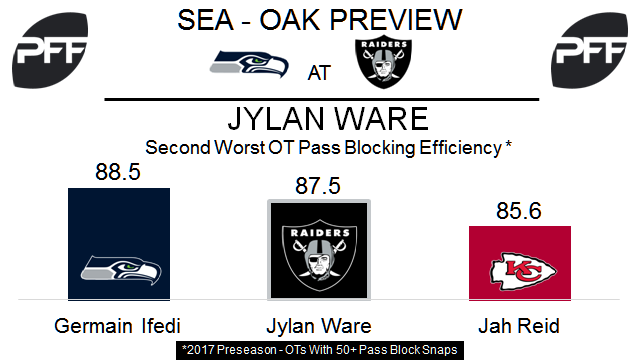 Drafted in the seventh round this year Ware has allowed one sack and eight total pressures in 50 pass-block snaps, and his 87.5 PFF pass-blocking efficiency (pressure allowed per snap with weighting toward sacks) is second worst among tackles with a minimum of 50 pass block attempts.